We normally think nothing of poems which express love and happiness, or sorrow and grief. But there is another emotion that is common to man-kind . . . hate. I have to admit, this is a topic of poetry which I really have little exposure to. So in preparing to write this article, I did some internet research. The very first thing I found was that there were many articles about people who hate to write poetry, or hate poetry in general, but not articles about hate poems. 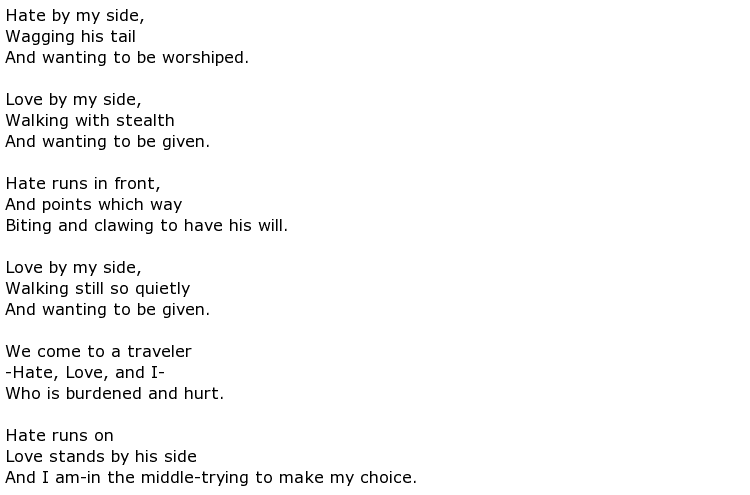 I did come upon a poem that was identified in many poetry-related websites. This is Hate Poem by Julie Sheehan. Although I stumbled upon a few poems written by angry, heart-broken teenagers, I found very few which are truly recognized in the poetry community. Sheehan’s poem is the major exception. 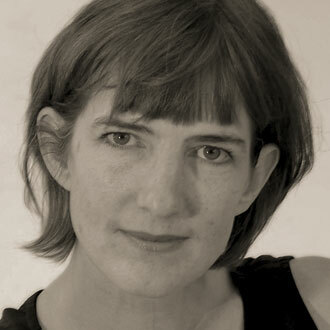 She is a contemporary poet who has written several highly acclaimed collections of poems, of which Hate Poem is one of them. One of those collections was Orient Point, which won the Barnard Women Poets Prize. She actually won several awards for poetry and is a professor at Stony Brook South Hampton on Long Island. What’s interesting about the poem is the way she began the work. According to Sheehan, the original opening line read “I love you truly”. She simply substituted the word ‘hate’ for the word ‘love’. She denies any real hate behind the poem. 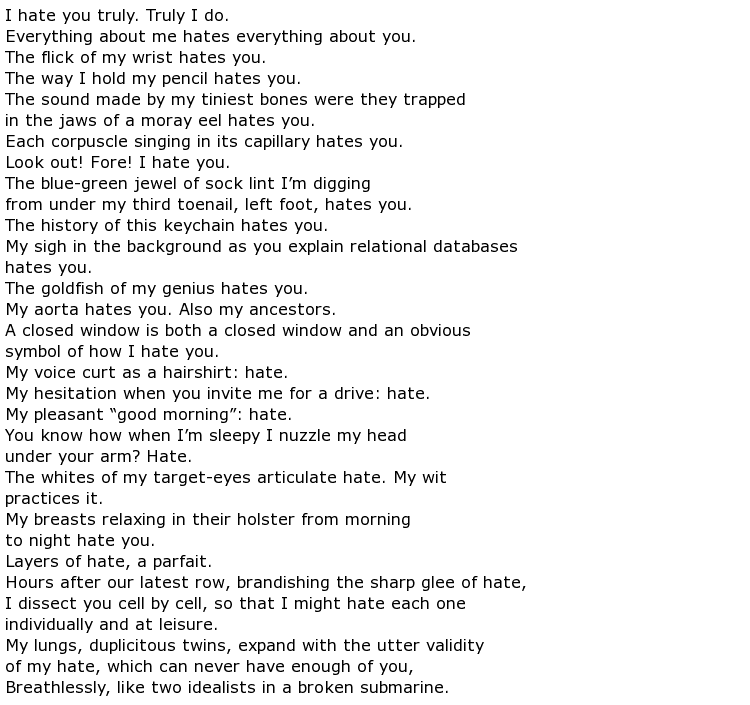 Sheehan wrote this poem to make an interesting comparison between two very similar emotions: love and hate. These two emotions require essentially the same degree of passion — the same intensity. Essentially, she is implying that hate and love are identical. Both require an almost mindless fanaticism. Both have been responsible for terrible actions. Innocent people have died because of the love someone felt, or for the hatred that they felt, toward some other person. Another poet who selected hate as the topic of their writing was W. B. Yeats. During the First World War, Yeats observed that the soldiers who fought in the battles honestly did not hate their opponents, nor did they hold any special affection for those they guarded or protected. They were just doing as they had been instructed to do. For Yeats, this was more of a political statement, rather than an actual judgment on the minds of those who had been placed on the battle fields. Like Sheehan, the line between love and hate becomes quite blurred. Although W. B. Yeats has been recognized for his poem which put some insight into the differences (or similarities) between love and hate, there is another poet who share the same family name who also writes about love and hate. Olin Yeats offers a slightly different perspective to the idea that love and hate are of similar emotional origins. In his poem, Hate, Love, and I, Olin Yeats expresses the notion that love and hate are both present within us at the same time, and that these two emotions actually ‘walk’ side by side throughout our lives.